How does a person celebrate St. Patrick’s Day and get another serving of fruits and veggies at the same time? You probably guessed. A green smoothie, friends. One of the few St. Patrick’s Day drinks not associated with beer (my beer-braised recipe is next week, silly). After last week, I thought I’d try to support your healthy resolutions alongside your vices. If you’ve never tried a green smoothie before (and a shamrock shake doesn’t count!) this is a great recipe to ease into it. 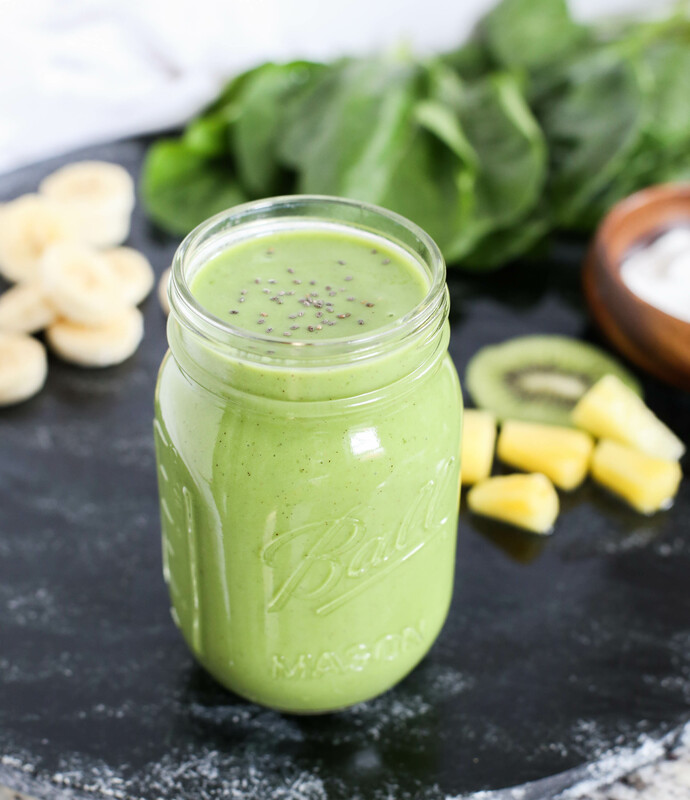 Green smoothies have been all the rage the past couple of years, but can be intimidating to make at home. Just give it a try and if you don’t like it, that’s fine. But you won’t know until you try it. 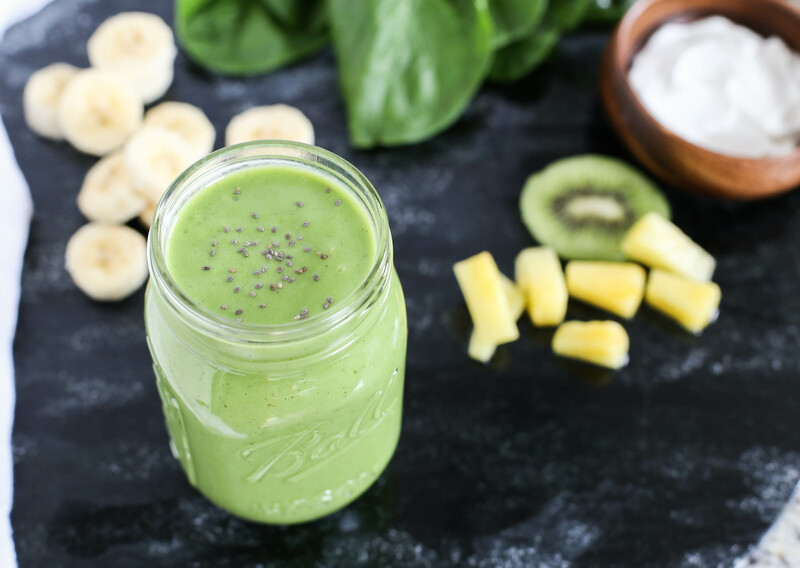 It’s actually easy to blend together and you get a huge serving of fruits and veggies: there’s pineapple, banana, kiwi, and spinach in this baby. I use frozen pineapple in this recipe, but you could substitute other tropical fruit such as mango if you prefer. I usually keep an eye on the frozen fruit at the grocery store to see when it’s on sale. Or if you’re lucky enough to live near Trader Joes, they have a wide variety of cheap frozen fruit. The fruit is actually what gives the green smoothie its flavor. How can something so good for you (and bright green) be tasty, you may ask? Well, there’s a lot of natural sugar in fruit, which makes the smoothie sweet. So you don’t even taste the spinach or banana. Banana adds creaminess to the smoothie (and to any smoothie really, I use it as the base for most of my smoothies). Spinach is the easiest leafy green to blend if you don’t have a high-powered blender. And it’s really key for the whole ‘green’ thing. 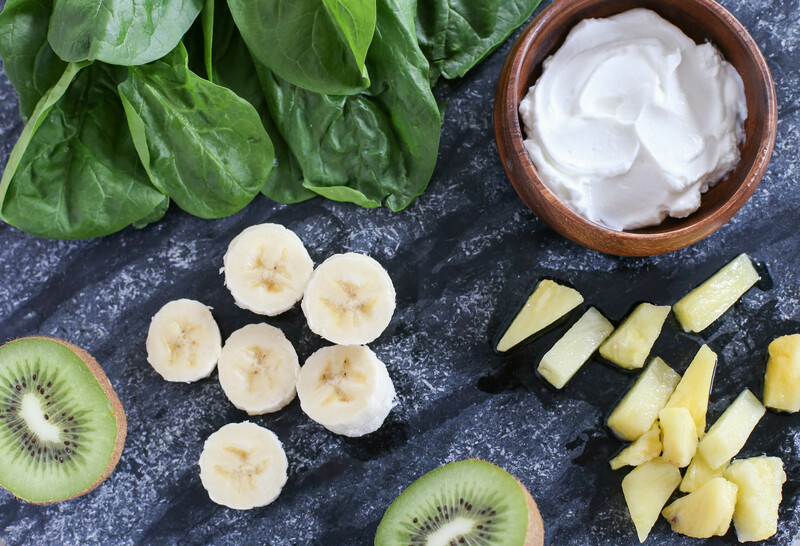 Among the other ingredients, Greek yogurt is added for thickness and protein, so the smoothie will keep you fuller longer. I use almond milk for the liquid, but that is the most versatile part of the recipe–you can use regular milk, cold water, or coconut water even. 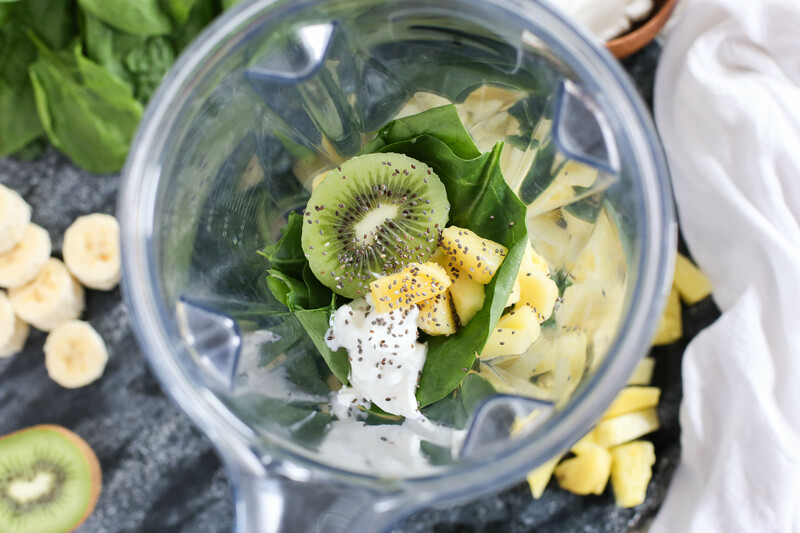 The optional add-ins for the smoothie include kiwi and chia seeds (omega-3 bonus!). Why not pile more greens on greens? I love kiwi because of its sweet, tangy flavor, and then there’s also the added health benefits. Little known fact, kiwi has twice the amount of vitamin C you need in a day. Both kiwi and spinach have a high amount of vitamin K (strong bones bonus!). And iron. And magnesium. And potassium. Which lowers blood pressure, and helps you maintain steady energy levels. Do you get where I’m headed with this? So many bonuses, for a snack that tastes good too. I store the smoothies in mason jars with lids and both my husband and I take them to work. Alternating with healthy chocolate smoothies sometimes, of course. 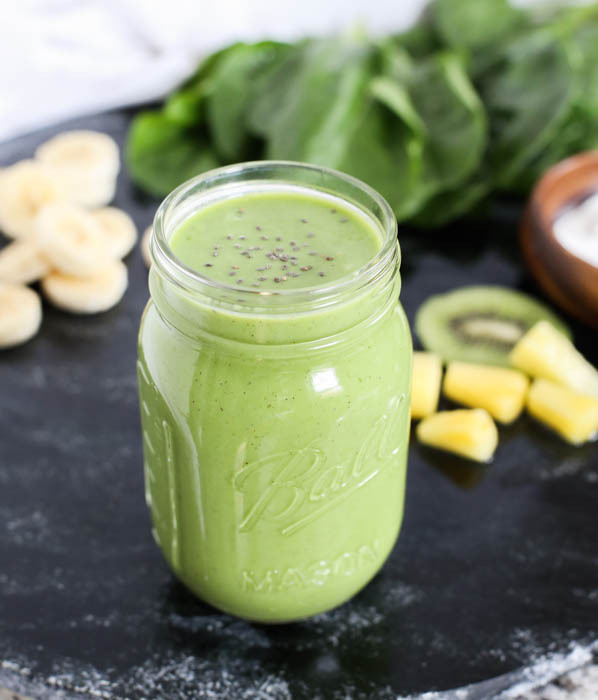 But in the spirit of all things Irish this week, try this easy green smoothie as a snack, as breakfast, or as part of lunch. You won’t regret it. Place all of the ingredients into a blender and process until smooth. Adjust yogurt and almond milk to taste. Add ice if desired.